Okay I don’t know how I lived without the Kiddie Catch-All! I have two boys both in carseats and they drive me crazy in the car by asking for their sippy cup, toys, or snacks! I try to load them up when I buckle them in but they drop stuff or it falls behind their backs in the car seats. With the Kiddie Catch-All I can put their sippy cup, snacks, and a small toy! It is big enough to hold more than just a sippy and it doesn’t get in the way! 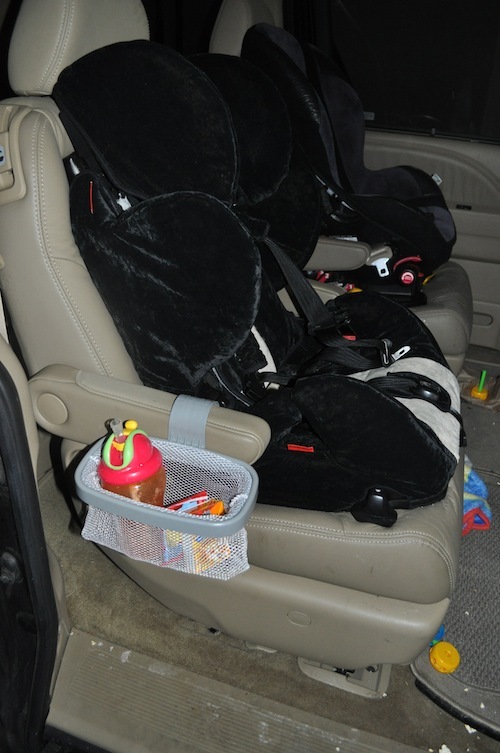 I was able to attach the Kiddie Catch-All on the side of the car seats that is closest to the door so I can easily put stuff in it and it doesn’t get in the way of anyone climbing into the backseat. I have a Recaro and Evenflo car seat right now in my Honda Odyssey mini-van and all you do is snap the Kiddie Catch-All on the car seat armrest, side of the car seat, or I was even able to attach it to the arm rests of the chairs in my mini-van. So basically the Kiddie Catch-All in my mini-van can be used long after we get rid of our car seats! The Catch-All is really perfect for so much and all ages! Even if you have a newborn, it is a great place to store extra toys or pacifiers to quickly find to soothe your child! I also love that the Kiddie Catch-All is big and wide. I have tried other car seat attachments but they either fall off or don’t fit the size sippy cup my son’s use. I will say the Kiddie Catch-All can be pushed off by your child, but so far my boys love having their own little baskets that they haven’t tried to remove it. I also wouldn’t really want the basket any bigger because then it would get in the way. 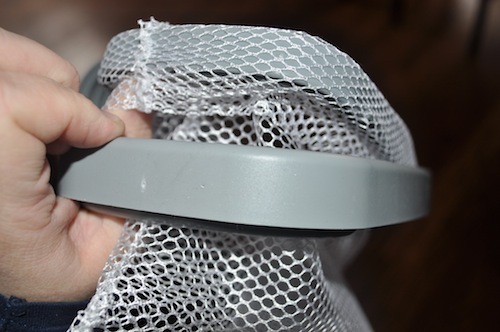 Oh and the mesh insert is removable so you can wash it if needed. The Kiddie Catch-All is going to be our lifesaver next month when we drive to Florida! But the Kiddie Catch-All really perfect for everyday use!